May 19, 2018 from 3pm to 5pm at the Eddie Mae Herron Center. View our Facebook event for updates! 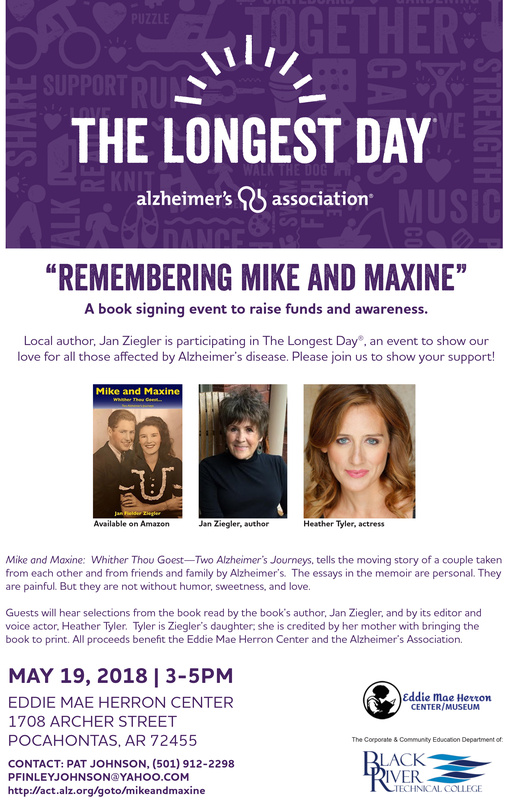 Local author, Jan Ziegler is participating in The Longest Day®, an event to show our love for all those affected by Alzheimer’s disease. Please join us to show your support! Mike and Maxine: Whither Thou Goest—Two Alzheimer’s Journeys, tells the moving story of a couple taken from each other and from friends and family by Alzheimer’s. The essays in the memoir are personal. They are painful. But they are not without humor, sweetness, and love. Guests will hear selections from the book read by the book’s author, Jan Ziegler, and by its editor and voice actor, Heather Tyler. Tyler is Ziegler’s daughter; she is credited by her mother with bringing the book to print. All proceeds benefit the Eddie Mae Herron Center and the Alzheimer’s Association.